What Does Guardianship Over a Child Mean? 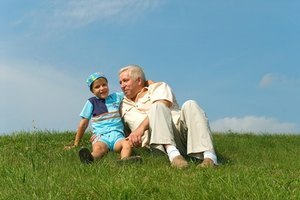 A grandfather often serves as caregiver to his grandson. 1 What Does Guardianship Over a Child Mean? 2 Is It Common to Fight With a Husband After the Birth of a First Child? A Caregiver's Authorization Affidavit is a document available to the millions of grandparents and other relatives who are raising minor children without parental involvement. The CAA authorizes a caregiver to enroll a child in public school and to obtain educational and medical services for him. The grandmother who is raising her grandchild is one example of a situation that benefits from a CAA. The U.S. Census 2000 showed over 2.5 million grandparents were the primary caregivers for their grandchildren. Each state that uses a CAA has its own list of "qualified relatives," which may include aunts, uncles, older siblings, half siblings, cousins or stepparents. Some states also authorize non-relatives: godparents, a relative's former spouse or a member of a child's tribe. The caregiver must be at least 18 years old, and the child must live with the caregiver. Children live with someone other than their parents for a variety of reasons including: absence of parents, family violence, unemployment, AIDS, substance abuse by parents, incarceration of parents and teen pregnancy. In these cases, a relative frequently steps in to assist a child. The CAA allows a non-parental caregiver to enroll a child in school and to participate in decisions relating to the child's education. The caregiver can authorize school-related medical procedures, such as required vaccinations. The affidavit also allows the caretaker to participate in decisions regarding special education services and parental activities. A CAA does not affect the rights of the parents or legal guardians and may be overturned by them. It does not give legal custody to the caregiver. It does not affect child-support arrangements. Many states offer a Caregiver's Authorization Affidavit. There are variations from state to state in the requirements. Check local laws concerning specific requirements and forms.